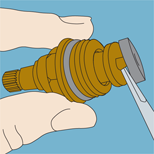 Summary: Learn how to replace a washer on a non-rising spindle tap, replace a washer on a rising spindle tap, reseat a tap, clean or replace ceramic discs, fix a leaking spindle or spout, repack the gland, replace an O-ring on a shrouded-head tap, replace O-rings on a kitchen mixer tap and replace O-rings on a shower-diverter unit. A dripping tap is usually an indication that the washer needs to be replaced. There are three basic tap designs: the rising spindle, the non-rising spindle and the mixer unit. Turn off the water at the stop-valve. Drain any water in the pipe supplying the tap by turning it on. It's a good idea to put the plug into the plughole to avoid losing any small parts should they get dropped into the sink. Prise or unscrew the top plate to reveal the retaining screw. Unscrew the retaining screw and keep it in a safe place. The head can now be removed. Using a spanner undo the headgear nut. 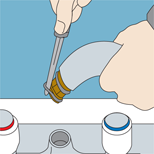 It is advisable to grip the body of the tap with a pipe wrench (first protecting the tap with a cloth) or by hand to prevent the tap turning and fracturing the connecting pipework. If the headgear nut is difficult to turn apply penetrating oil around the joint and allow it to penetrate the joint for about 10 minutes. 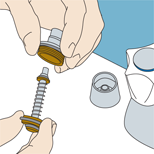 Remove the rubber washer at the base of the tap by prising it off with the blade of a slot headed screwdriver. There may be a small nut holding the washer in place, which needs to be unscrewed first before the old washer can be removed. 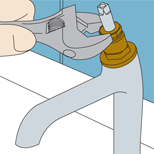 Fit the new washer and grease the thread at the base of the tap before reassembling. Using a spanner undo the headgear nut. Remove the rubber washer by prising it off with the blade of a screwdriver. It is a good idea to put the plug into the plughole to avoid losing any small parts should they get dropped into the sink. 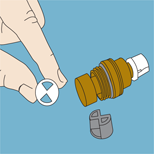 Remove the coloured (red or blue) plastic index disc on the top of the tap and unscrew the retaining screw to remove the capstan head. The bell-shaped metal shroud can now be removed. If the headgear nut is difficult to turn apply penetrating oil round the joint and allow it to penetrate the joint for about 10 minutes. At the same time you replace a washer it is a good idea to inspect the valve seat inside the body of the tap for scaling or grit, as this can cause a leak despite the new washer. 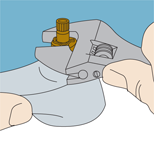 There are two methods used to remedy this problem: use a tap reseating tool, which can be bought or hired, to grind the seat smooth; or buy a washer-and-seating set. Dismantle the head of the tap including the washer to leave the base and spout. The reseating tool is then screwed into the body of the tap. Make adjustments to the tool until it is in contact with the seat, but be careful not to damage the thread. Turn the tool to grind down the seat. Inspect the grinding disc for black marks which indicate the seat needs more grinding. When the black marks disappear from the grinding disc the tap is sufficiently ground. Replace the valve and reassemble the tap. 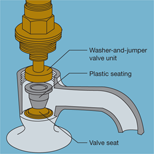 A washer-and-seating set comprises of a plastic seat that fits into the valve seat and a washer-and-jumper valve unit that fits into the headgear of the tap, replacing the old ones. 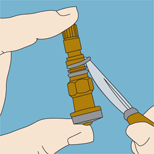 Reassemble the tap and turn it to the closed position as fully as possible, as this ensures the new seat has been fixed in position correctly. Taps with ceramic discs at the base of the tap operate differently to conventional taps with washers and spindles. 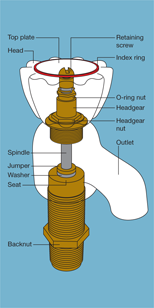 A cartridge is situated in the body of the tap that contains two ceramic discs, each with two holes in it. While one disc is in a fixed position, the second disc rotates when the handle of the tap is turned. When the holes in the discs line up the water flows through them. When the tap is turned off, the holes are no longer aligned, thus stopping the water flow. Unscrew the retaining screws to remove the tap handles. Using a spanner remove the headgear section. The two ceramic cartridges are different as the left-handed one operates the hot tap and the right-handed one operates the cold tap. Remove the ceramic discs and inspect them for damage and dirt. If they are worn they will have to be replaced with new cartridges. It is advisable to take the old cartridge to the DIY store to ensure you get the correct size. If the problem is caused by dirt on the ceramic discs, then clean them with a damp cloth. Check the rubber seal for wear and replace it if necessary. Reassemble the unit ensuring the hot and cold cartridges are put back in the correct taps. Remove the ceramic discs and inspect them for damage and dirt. 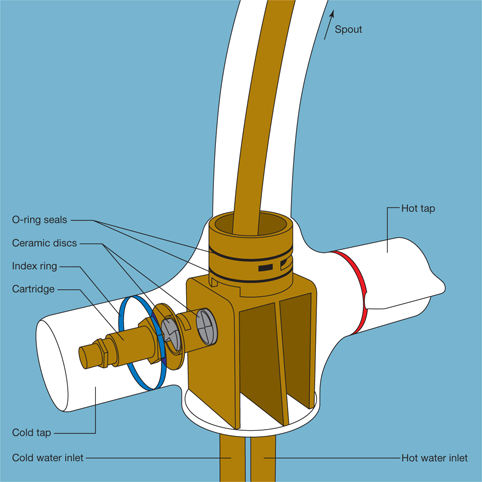 Water leaking from around the spindle, at the base of a swivel spout or from around the diverter knob of a shower mixer tap could indicate a faulty gland nut or O-ring seal. With the tap turned off, unscrew the small retaining screw and remove the capstan handle. 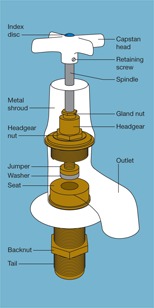 Remove the bell-shaped metal shroud to reveal the gland nut which is the first nut on the spindle. Using a spanner, tighten the gland nut by about half a turn. Put the capstan handle back on the tap to check the adjustment has stopped the leak. If it has, turn the gland nut another quarter of a turn. It is important the gland nut is not over tightened, as this will result in the tap being difficult to turn off. Using a spanner, tighten the gland nut by about half a turn. 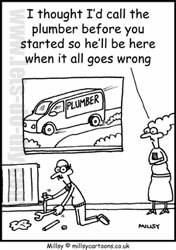 With a spanner unscrew the gland nut. Using the blade of a small screwdriver remove the old packing. Then using gland packing string or a length of PTFE tape stretched into a long string, repack the gland pushing the packing into place with the blade of a small screwdriver. Screw the gland nut back on and reassemble the tap. Unscrew the gland nut and remove it. Turn off the water supply at the stop-tap. 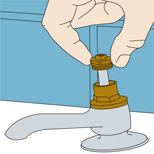 Remove the tap's handle and headgear using the same method as you would to replace a washer. Hold the headgear and turn the spindle anti-clockwise to remove the washer unit. Locate the O-ring at the top of the washer unit and cut it away with a penknife. Before fitting the new O-ring in position smear it with silicone grease. Turn off the water at the stop-tap. Drain any water in the pipes by turning the taps on until the water stops running and then turn them off. Locate the retaining screw behind the spout and remove it. If the tap unit does not have a retaining screw, turn the spout so it's in line with the body of the tap and pull it up sharply. The spout should come away from the body of the tap. There will probably be two O-rings on the bottom of the spout, so make a note of their positions and remove them with a penknife. Smear the new O-rings with silicone grease and fit them in the correct position on the bottom of the spout. Lubricate the inside of the spout end with petroleum jelly and then refit it to the body of the tap. Make a note of the position of the O-rings and remove them with a penknife. Ensuring the bath taps are turned off, lift the knob of the shower diverter and undo the headgear nut with a spanner. Remove the diverter body and take note of the position of the O-rings and washers. Unscrew the knob from the diverter body by turning it anti-clockwise. This will allow you to remove the rod and plate from the diverter body. A small O-ring will be at the top of the rod. Apply silicone grease to a new small O-ring and fit it in position at the top of the rod. Remove all the old washers and O-rings at the base of the rod and plate and replace with new ones. Reassemble the shower diverter unit.